Monday mornings can be rough and sometimes a struggle to get out the door but skipping breakfast is NOT an option. 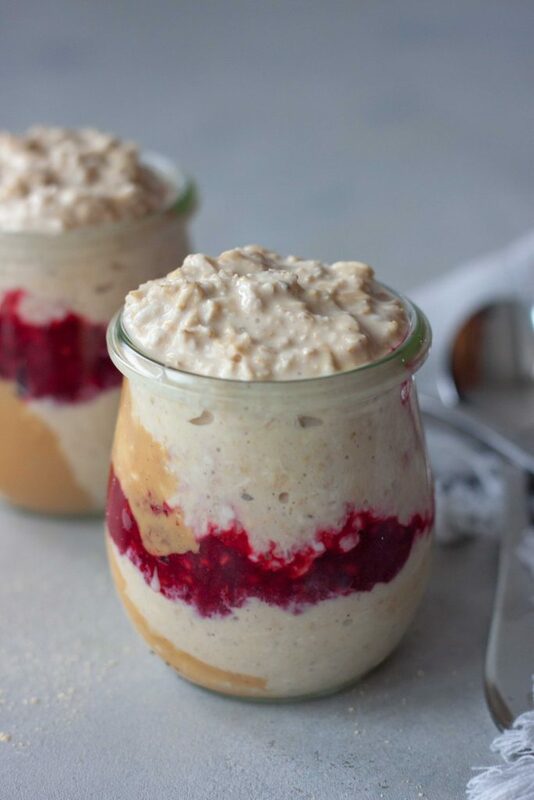 Creamy PB&J Overnight Oats make mornings, especially Monday mornings, easier! With only a couple minutes of prep the night before you have breakfast ready to grab and go in the morning. Like most foods we go in phases in our house and overnight oats use to happen multiple times a week. Last fall we brought them back but more “Smoathies” a cross between a smoothie and oats and we would just make oats on the stove on chilly mornings when we crave them. With those recipes last fall it dawned on me that they could be enjoyed cold or warmed up which with out Minnesota weather in the winter is key. On chilly mornings just take the extra 2 minutes to warm them up first and go. Yes as much as I hate to admit it some mornings are rough and I end up eating my breakfast in the car in the drop off line at school, not nearly as often as I use to though. 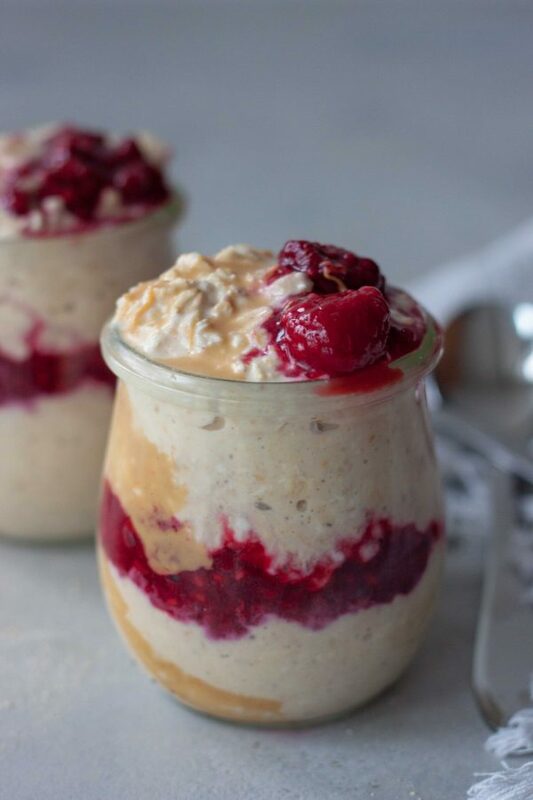 I had planned to share another version of overnight oats the I’ve been loving lately but the girls are home from school and honestly you can’t beat the classic combo of peanut butter and jelly! Always hits the spot for me, and the family. Not sure if we’ll enjoy them today but I did prep some just in case we decided to go off and do something fun, which will depend on the weather. If we decide to have a more relaxing morning and make pancakes or waffles we’ll just enjoy them tomorrow as Tuesday is a really crazy morning for us as I teach a class up at the school before school starts. Warmed up and swirled with peanut butter and strawberries. Since I’m making them for the family I leave out the chia seeds I usually add and just make this creamy peanut butter version, with extra peanut butter swirls and or drizzle, and lots of fruit instead of jam! When using fresh fruit we usually use a little more, about a cup, while using a little less for frozen fruit. Using frozen fruit makes them even easier for prepping the night before as you can just grab your berries from the freezer and there is no cleaning or cutting. Just be sure to look for no sugar added fruit. When berries are in season and look good we like to use those. The optional berries and drizzle on top are optional. Usually when enjoying these on the go we use mason jars or jars a little bigger so you can just add the toppings on top in the morning or the night before and just stir them up. Even stirred and not layered they look good, and taste just as delicious! 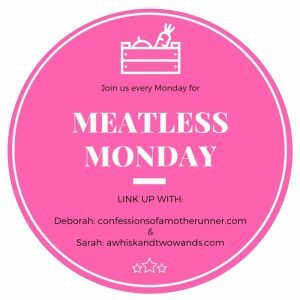 Even though today is a holiday and many of you might be off from work it’s still Meatless Monday over here! Deborah and I look forward to seeing what’s cooking, or not cooking, in your kitchen this week. Link up with us below or just tell us in the comments and we hope some of the recipes linked up below inspire you! Hope you have a great week! Mix oats, 1 cup of milk (see notes), and peanut butter powder. Place in the refrigerator overnight or for 6 hours. To make as shown I take a little peanut butter and smear in the jars before layering. Heat oats for a couple of minutes if wanting to enjoy warm, adding a little more milk if needed to reach desired consistency (see notes). Layer 1/4 of the oat mixture into 2 jars, then layer in berries reserving some for the top, and remaining oat mixture. Top with berries and more peanut butter or peanut butter drizzle (see notes) as desired. Quick and easy grab and go single servings. In 2 jars mix 1/2 cup of oats, 1/2 cup of milk, and 2 tablespoons of peanut butter powder. If using unsweetened milk I usually add 1 packet of stevia in the raw, otherwise you can sweeten later if you aren't sure or add a little sweetener as you would your regular plain oats. Top mixture with frozen or fresh berries and a spoonful of peanut butter. Store in the refrigerator 6 hours or overnight. In the morning stir them up, heat in the microwave for a couple of minutes if you want to enjoy warm, and enjoy! *When I know I'm going to enjoy them warm I usually add a little more milk as the oats soak up a little more of the liquid. If you know you're going to heat them up add the extra half cup called for in the recipe or if you normally like yours a little thicker you can heat them up as is and add a little milk to thin them out and reach desired consistency. Using a thicker milk will produce richer creamier oats but we use all kinds of milk in our overnight oats from 30-45 calories unsweetened almond, coconut, or flax milk to homemade milk or one with protein like Ripple. For added protein either use a protein milk as noted above or add vanilla protein powder and additional milk to reach desired consistency. The amount of milk will depend on the protein powder used but when using 1 scoop of Vega Sport I use 1 cup of unsweetened non dairy milk, 1 scoop protein, 1/2 cup of oats. If heating up I add an additional 1/4 cup of milk. To thin peanut butter out a little to drizzle add a little coconut oil. Of course, it’s cold here but we never seem to decide until morning so we add the milk after. If you add it before your oats might be too thin for your liking and if not adding any they are REALLY thick. That is the most beautiful oatmeal ever! Thank you! Thank you for linking up as well I wasn’t able to comment on your post, the comment section was turned off. Yum, yum, yum. I haven’t made overnight oats in so long, I guess because I work from home now…but I miss them! These look so yummy and I love that powdered PB in there for more PB flavour without going overboard on fats. We were the same way, hadn’t had them in awhile but back in the rotation for busy mornings when we have to get out the door earlier. SOOOO much fun!! Of course I love all these things on their own, but then how you layered them and I bet the combo together is just so satisfying! You can have your peanut butter separate from your jelly, just make the pb and have strawberries on the side. 😉 Layered, swirled, separated it will still hit the spot! I’m pretty sure you’d love these! Thank you! 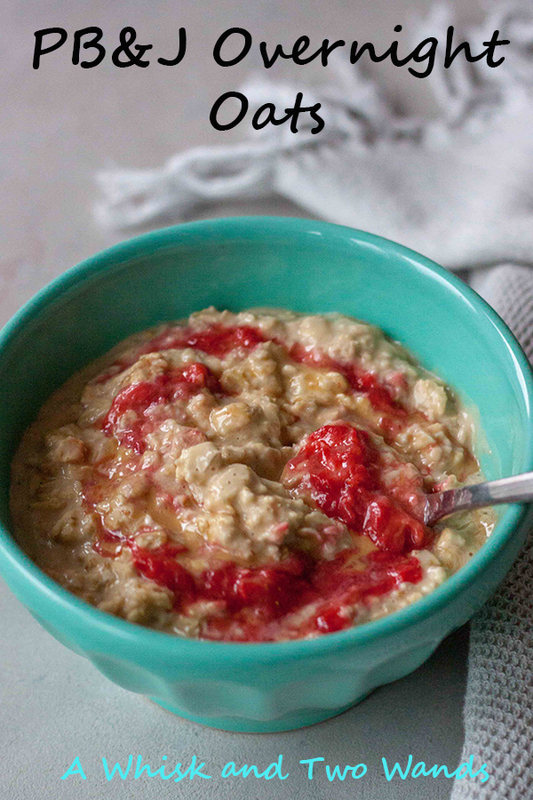 Your oatmeal creations always sound so amazing! Thank you, they’re a staple here in the winter! This looks delicious! Overnight oats is one of my favorites! Thank you, classic combo that never grows old! I’m so making these so I can have some for tomorrow morning! Looks so so so good! Hope you loved them as much as we do! Thank you for sharing on social media. Peanut butter and jelly is life! 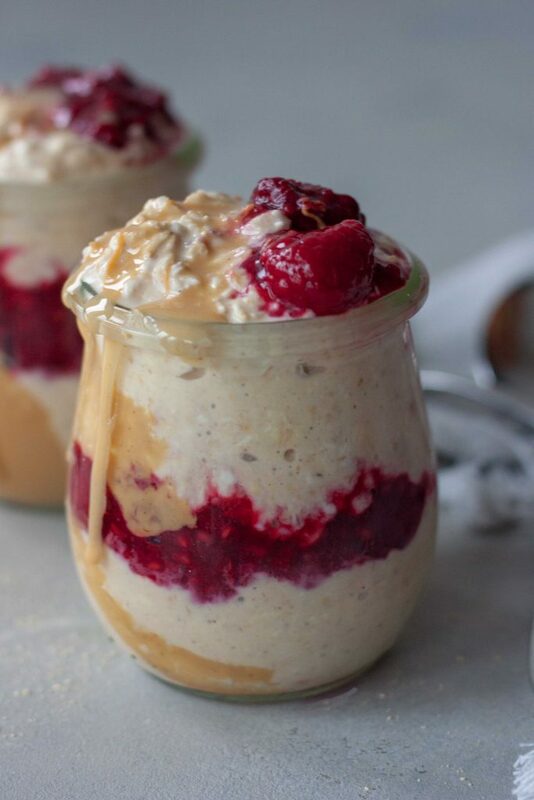 I’m obsessed with overnight oats, so I NEED to make this ASAP. I think you’d love these, can’t go wrong with this classic combo! I’m a total peanut butter breakfast fanatic so this is right up my alley! Alisa Fleming recently posted…Sesame Ginger Tofu: Marinated to Enjoy Fresh or Baked! You’d love this one Alisa, I’m sure of it! I keep seeing peanut powder in recipes but have yet to try it. On my list! You can buy it pretty much anywhere. I remember getting it about 10 years ago when it was hard to find and so happy it caught on. Oh my goodness! 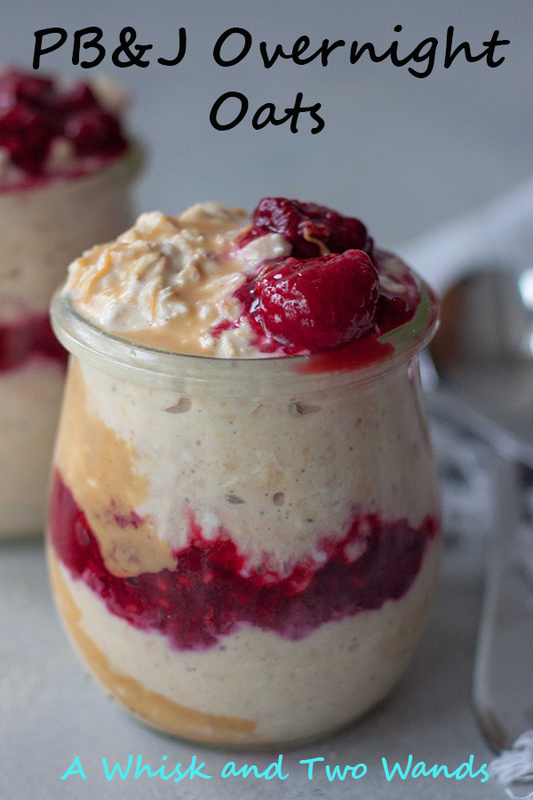 Those layers look so good and I love PB&J sandwiches but never thought to make it into an oatmeal! You cannot go wrong with a classic like PB&J. Awesome flavors for overnight oats. You really can’t, always hits the spot! 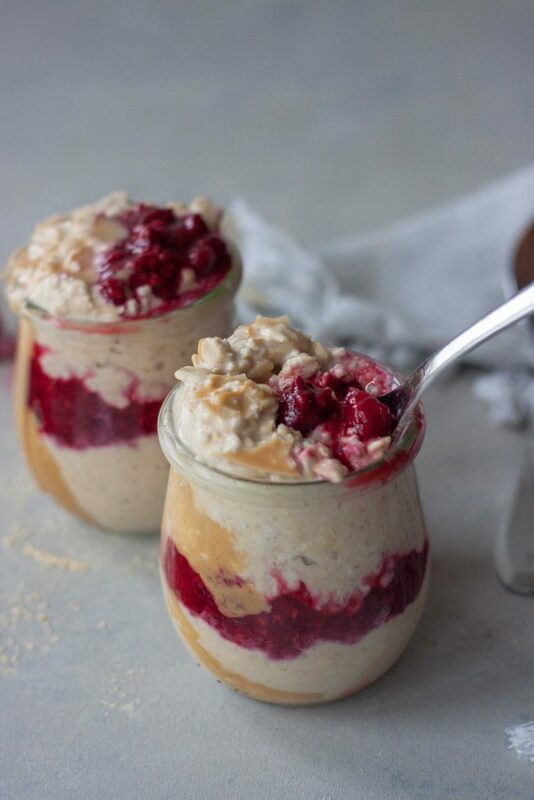 I have not made overnight oats in forever but this pb & j version look amazing! I hadn’t until last fall and with a couple early mornings we’ve brought them back. I’m totally trying this for breakfast this morning! Minus the overnight part, but hoping they come out good on the stove! Stove top we do the same way but cook them with water and then stir in pb powder and a splash of milk. These look so good! Definitely something I’m going to try. I have oats most mornings for breakfast. Thank you, hope you enjoy them as much as we do! Oh yum. This looks divine! My kiddo is obsessed with PB&J sandwiches for pretty much any meal – maybe this will help expand his breakfast palate a bit, haha! Looks delish. You’ll have to give it a try! Hopefully he’ll like it, they’re a healthy start to the day! Hope you do, keep me posted! Why have I never thought to do PB&J oatmeal? This sounds like such a good combo. Love this easy recipe! Pinned to my “Eat Your Breakfast” board! This looks all kinds of amazing!! I’m definitely gonna have to try making some soon! *-* I have everything I need to make it! <3! Thank you Farrah, hope you enjoy them as much as we do!